President Uhuru Kenyatta is the most popular leader in Sub-Saharan Africa. 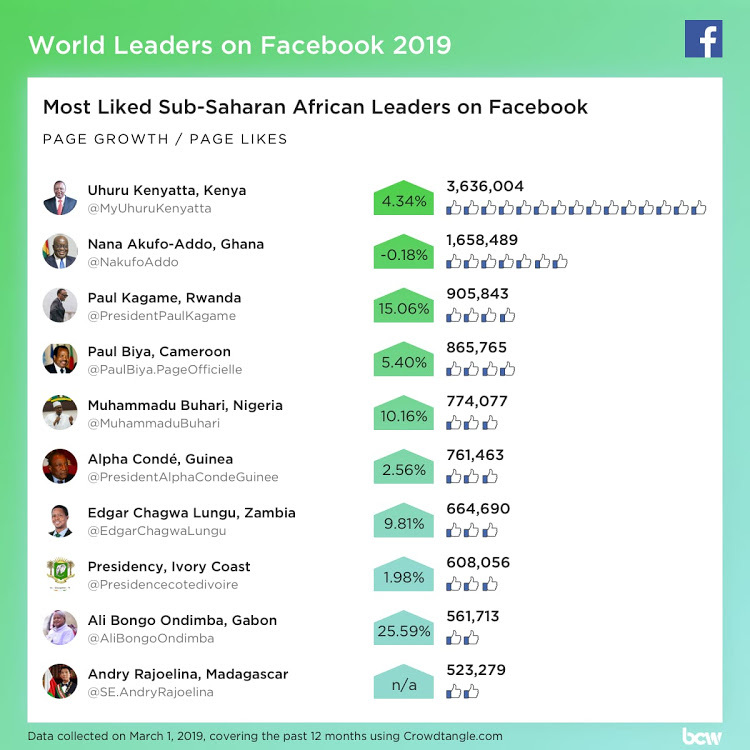 In the latest research by Burson Cohn & Wolfe for 2019 World Leaders on Facebook, Uhuru has 3.6 million likes on Facebook, ahead of Ghana’s President Nana Akufo-Addo with 1.6 million likes. However, Indian Prime Minister Narendra Modi remains the most popular world leader with more than 43.5 million likes on his personal page. Modi has 13.7 million likes on his institutional Prime Minister of India page. The study also found increased use of paid posts by world leaders. US President Donald Trump is in second place, with more than 23 million likes on his personal Facebook page. Jordan’s Queen Rania is in third position with 16.9 million likes, reaching an Arabic and English audience well beyond the 5.8 million Facebook users in Jordan. “Brazil’s new President Jair Bolsonaro, who took office on January 1, 2019, has dominated the rankings of World Leaders on Facebook over the past 12 months, taking the top spot in terms of interactions,” Chad Latz, Chief Innovation Officer said in a statement to newsrooms. The research indicate that Bolsonaro’s Facebook page has registered more than 145 million interactions, almost twice as many as U.S. President Donald Trump, who has 84 million total interactions and 2.5 times as many followers. The study, using aggregate data from Facebook’s CrowdTangle tool, analyses the activity of 962 Facebook pages of heads of state and government and foreign ministers, 50 more than in the 2017 study. As of March 1, 2019, the pages have a combined total of 345 million page likes and published 449,739 posts in the past 12 months which have garnered a total of 767 million interactions (comments, likes and shares). “With Facebook’s change of algorithm, favouring posts from friends, family and groups, it has become more difficult for pages of governments and world leaders to reach their audiences,” Latz said. According to the research, followers of world leaders’ Facebook pages grew by 10 per cent year on year but the interactions on their pages have dropped significantly. “While world leaders registered 1.1 billion interactions in 2016, that number has decreased by 32.3 percent compared to their interactions in 2018,” he said. He added, “To counter the changes to the algorithm, many leaders are promoting their posts and pages with Facebook ads”. The research reveals that by early March 2019, 50 pages had been running ads according to Facebook’s Ads Library, a new transparency feature which is now available on each page. President Trump’s Facebook page has posted more than 50,000 ads since its inception, while UK Prime Minister Theresa May’s page posted 74 paid ads in December 2018 to promote her Brexit plan. “Our latest Twiplomacy study confirms that even among political figures who easily attract the attention of the public in social media, a paid strategy is still essential to secure reach and make a serious impact,” he said. “We see how some leaders are very successful by being personal and approachable on the platform using all the tools at their disposal, from Facebook Live to Facebook Stories, to engage their audiences”.